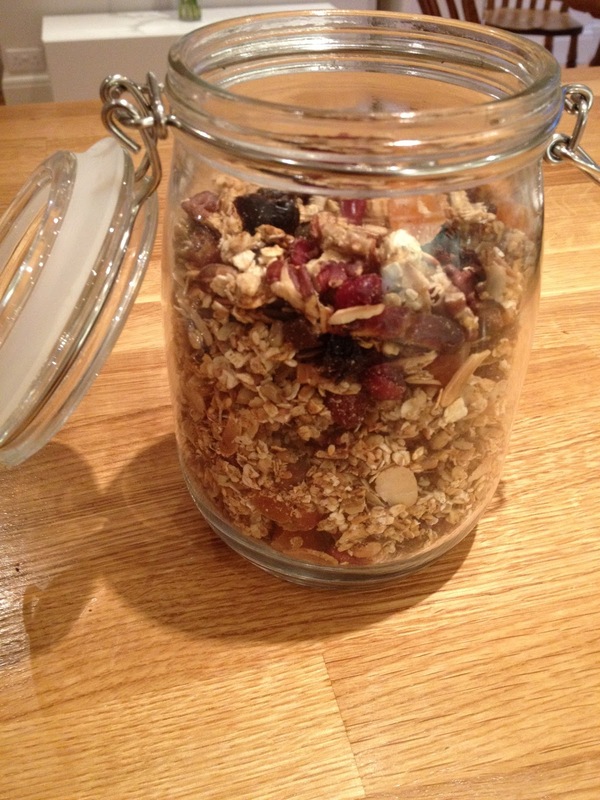 I love granola with Total 0% Greek yoghurt but shop bought cereals and granola's are mainly filled with sugar. It's so easy to make it yourself and you can make exactly the mixture you like plus you know what goes into it. Win, win! You can also make it gluten free, just make sure the oats you buy are gluten free. Start by putting 200g of rolled oats into a bowl, add a handful of chopped nuts (I used pecans and flaked almonds) and a smaller handful of chopped dried fruit (I used dates, apricots and cranberries), a dessert spoon full of coconut oil (this is optional, but is a good fat and can now be bought in most supermarkets), one egg, a teaspoon of cinnamon and a pinch of nutmeg. Mix well and place in a thin layer on a baking tray and bake at 180C for about 15-20 mins until it is golden. If you want it sweeter you can add agave syrup or honey, but this obviously makes it less healthy. Allow to cool and store in a air tight container. I like to serve it with Total 0% Greek yoghurt, which is lovely, thick and creamy and not acidic like some natural yoghurts.